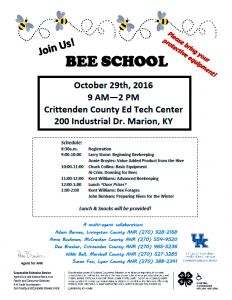 On Oct. 29, extension agents from Livingston County, McCracken County, Crittenden County, Marshall County, and Lyon County will host a Bee School at Crittenden County Ed Tech Center. The event will last from 8:00 a.m until 3:00 p.m. Speakers include Larry Stone, Annie Broyles, Al Crim, Kent Williams, and John Benham. A flyer for the event can be downloaded here. Questions about the event should be directed to Adam Barnes, Livingston County extension agent (270) 928-2168 ; Amie Buckman, McCracken County extension agent (270) 554-9520; Dee Brasher, Crittenden County extension agent (270) 965-5236; Nikki Bell, Marshall County extension agent (270) 527-3285; or Susan Fox, Lyon County extension agent (270) 388-2341.